God is faithful. What He says He will do. What He promises is true. We can trust God and we can trust His promises. The things that are in the Bible are true. They aren’t just made up to make you feel better. God has follow through and consistency, unlike our best intentions, or the best intentions of others who we put our faith in, only to be let down. Philippians 1:6 is one of those faithful promises: I am sure of this, that He who began a good work in you will bring it to completion at the day of Jesus Christ. God will establish you. That means that God will make you strong and able to maintain spiritual growth. God will finish the work He started in you, God will give you the strength and the ability to stand and to grow. Paul had confidence that God would keep the Thessalonians strong because God kept Paul strong. I have confidence that God will keep a hold of you with His righteous right hand (Isaiah 41:10), because He has done that for me, even in the worst times. God guards us against Satan. Now that’s good news. As you read through the Psalms, you will see that David says over and over again that God is his refuge, his shield and his protector. Just as David had physical enemies that were always trying to do him in, we have spiritual enemies that try to do the same to us. We might not even realize that the struggles we are having are because of Satan’s schemes at work against us. Whether we realize it or not, God guards us. If we belong to Jesus we will grow in our obedience to Him. God does this in us because He is at work in us. Philippians 2:13 states: It is God who works in you, to will and to work for His good purpose. Paul could say he had confidence that they would be obedient because he had confidence in how God works in our lives. We can rest in the love of God and the steadfastness of Jesus. Paul prayed in Ephesians 3 that we would know how high and deep and wide and long the love of Christ is because we are rooted and grounded in love. You are loved with an overwhelming love and nothing can separate you from that love. Jesus now sits at God’s right hand, ruling and holding the world together. And more good news: He also kneels for us according to Hebrews 7:25, He lives to make intercession for us. Be encouraged today, knowing that God is at work in you. He is faithful and will protect you from Satan’s attempts to discourage and to derail you. You are loved by God and that love never changes. Rest in God’s enabling power and call on Him to work in your life today. 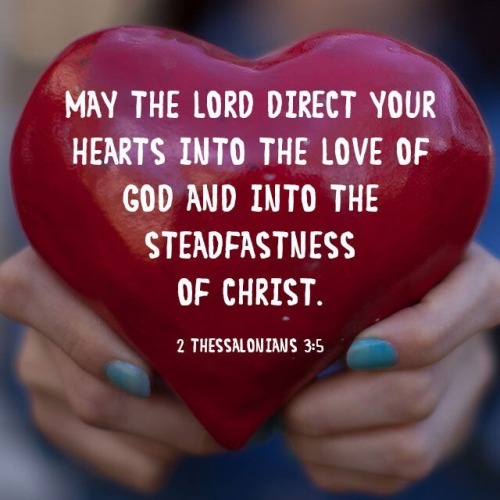 This entry was posted on Sunday, April 30th, 2017 at 1:38 pm	and tagged with 2 Thessalonians, Discipleship, Faith, God's enabling power, Mindset, perspective, Prayer, Spiritual growth and posted in Bible, Christian, Christianity, Devotional, The Christian Life. You can follow any responses to this entry through the RSS 2.0 feed.